The Coast Guard has identified a sunken fishing vessel missing since 1972. a remote operating vehicle (ROV) to investigate. 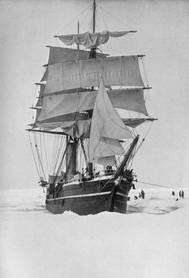 The fishing vessel Katmai was discovered in 8,920 feet of water approximately 200 miles offshore. After receiving data of the discovery from BOEM, the U.S. Coast Guard Investigations National Center of Expertise initiated a cold case investigation, the result of which has now been published by the Coast Guard. Oskar Joos, his wife, eight-year-old child and deckhand Clinton Hollevoet departed Mobile for Anchorage, Alaska on the fishing vessel Katmai Feb. 18, 1972. Schmidt Ocean Institute’s flagship 'R/V Falkor' locates the wreck of historic exploration ship off the coast of Greenland. During routine functional performance testing of the mutibeam mapping echosounders on the Schmidt Ocean Institute’s flagship R/V Falkor, the team aboard — including researchers from the University of New Hampshire, Ifremer, and Woods Hole Oceanographic Institution — discovered the S.S. Terra Nova, a whaler, sealer and polar exploration ship that sunk off the southern coast of Greenland in September, 1943, after being damaged by ice.